It’s not uncommon these days for successful games to be bundled with their DLC and repackaged as Game of the Year editions. It’s a great way of attracting gamers who passed on the game originally by offering lots of extra content. Just as the first LittleBigPlanet got the GOTY treatment, so too will the sequel – this time dubbed LittleBigPlanet 2 Special Edition. Sony will also be offering the Special Edition in a Playstation Move bundle for an even better deal. 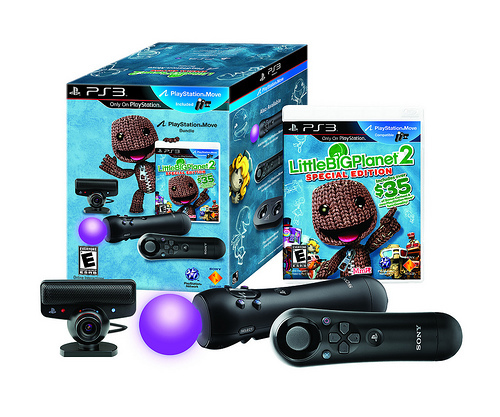 PlayStation Move support: Now you can choose to play LittleBigPlanet 2 with all new Move controls and enjoy the over 6,000 Move games created by fans like you…FOR FREE! Endless Fun! LittleBigPlanet 2 Move Pack: Rise of the Cakeling: A whole new adventure in which a rogue cake threatens doom and destruction, and you Sackfolk must once again attempt to restore peace to Craftworld, featuring 5 new levels + 7 mini-levels, and tons of goodies. Plus, all of the cool new Move tools to let you Create and Share your own “Move” games for the rest of the community to Play! This suite of new creative tools give you the power to create your own Move games, record fluid motions, and paint your own stickers, while using a boatload of new stickers, materials, decorations, costumes, music, sound and sequencer objects that will vastly broaden your creative palette, and make your Popit burst at the seams. Disney/Pixar’s Toy Story Level Pack– five new levels + two mini-levels + one Alien costume and more goodies. Disney/Pixar’s Toy Story Costume Pack – Buzz Lightyear, Slinky Dog, Hamm, and Rex costumes for Sackboy! LittleBigPlanet 2 Special Edition retails for $59.99 while the LittleBigPlanet 2 Special Edition Move Bundle lists for $129.99. But you can get the Move Bundle much cheaper by purchasing at Amazon for only $99.99. Both the Special Edition and Move Bundle will debut on Tuesday, November 15. Page created in 0.4345 seconds.